Inner Banks Living Blog » Has the period of expansion already begun? Record Low Lot/Land Prices. Has the period of expansion already begun? 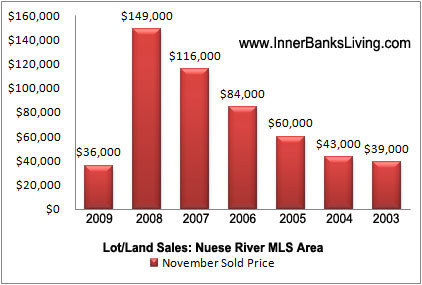 The Neuse River area land and lot average sold price for the month of November was at a historic low level. The information gathered to make the graph you see comes from the Neuse River Board of Realtors database of sold lot and land properties. Are the prices going to keep dropping? No, I don’t think so and here’s why. Expansion – Equilibrium – Decline – Absorption. These are the four stages of a real estate market. The time to buy is in the cycle of absorption. And never had the absorption rate been so high as in the November of 2008, according to the Crystal Coast Board of Realtors. The Absorption Rate is a measurement of a market’s ability to sell of its inventory. This takes into account the current active inventory, the amount of sales over a specified time period. In other words, If you take the rate in which properties come on the market for sale and the rate in which properties go off the market as sold-How long will it take to sell off all of the inventory. In a “normal” stable market it takes about 6 months to sell off a property. That’s why listing agreements are (or rather were) for 6 months. Marc Stephan Garrison, founder of the National Association of Real Estate Investors says, “All real estate exists in one of four-cycle stages and that would be Expansion, Equilibrium, Decline, and Absorption. I invest, and take investor clients, into absorption markets. In November of 2008 was the peak for the over-all glut. The housing market had a 33 month supply of inventory and the land/lot market had a 454 month supply of inventory. No-That wasn’t a typo-Land/lot absorption was at almost 40 year supply. The absorption rate for November 2009 has fallen tremendously. It is down by about 2/3’s of what it was the year before. This means that sales are climbing and in turn means prices will start to climb too. Is this the beginning of an expansion period? Could it be that the 2003-2005 real estate gold rush is about to repeat in 2010? No one can answer that for sure. But I would highly encourage everyone to take a hard look at the opportunity that is currently presenting itself.